SYDNEY (Reuters) - Australian Prime Minister Tony Abbott has warned Indonesia of the potential for diplomatic fallout if Jakarta goes ahead with the looming execution of two Australian citizens on death row for drugs charges. 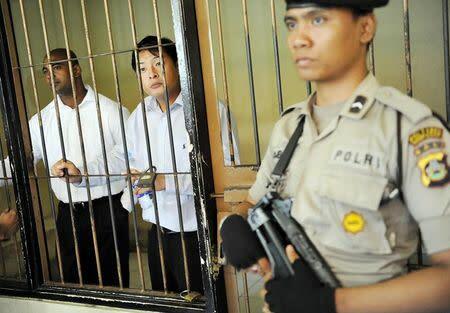 Australia has been pursuing an eleventh-hour campaign to save the lives of Myuran Sukumaran, 33, and Andrew Chan, 31, two Australian members of the so-called Bali Nine, convicted in 2005 as the ringleaders of a plot to smuggle heroin out of Indonesia. The case has enormous resonance as a domestic political issue in Australia, and Abbott ratcheted up the rhetoric at the weekend amid a growing campaign to boycott travel to Bali, one of the most popular destinations for Australian tourists. "We will be finding ways to make our displeasure felt," Abbott told Australia's Channel Ten on Sunday. "Millions of Australians are feeling sickened by what might be about to happen in Indonesia." It was unclear what measures Abbott was considering, but Australia and Indonesia have a long history of diplomatic tensions, which have periodically complicated cooperation on regional issues including people smuggling and intelligence. Indonesia recalled its envoy and froze military and intelligence cooperation in 2013 after reports that Canberra had spied on top Indonesian officials, including former president Susilo Bambang Yudhoyono's wife. Full diplomatic cooperation was restored in May last year, but Foreign Minister Julie Bishop last month refused to rule out following Brazil and the Netherlands in withdrawing its ambassador from Jakarta if the executions went ahead. Those two countries withdrew their ambassadors last month after two of their citizens were among six people executed for drugs offences. Australia outlawed capital punishment in 1973 and public opinion is staunchly against the death penalty for any crime. The last Australia citizen executed by a foreign government was Nguyen Tuong Van by Singapore in 2005, also on charges of smuggling heroin. That incident had little effect on bi-lateral relations. But the execution of two Australians for drug offences in Malaysia in 1986 saw relations plummet. In Sydney more than 150,000 people signed a petition for clemency that was handed over to the families of the prisoners at the weekend. A boycott campaign has also been building on social media, where Australians have been using the Twitter hashtag #BoycottBali to announce the cancellation of their holiday plans. International pressure is also mounting over the executions. United Nations Secretary-General Ban Ki-moon appealed to Indonesian Foreign Minister Retno Marsudi on Thursday not to move ahead with the executions.